Download links for Shelflings #6, a 64pp issue of our irregular reviews ezine, will appear in the next members-only BFS bulletin. This issue collects reviews that appeared on the BFS website during August and September, as edited by Craig Lockley, Phil Lunt, Guy Adams and Jay Eales. The reviews are by Abbas Daya, Allen Stroud, Brian Ennis, Dave Brzeski, Guy Adams, Mario Guslandi, Nigel Robert Wilson, Rosetta Newman, Sandra Scholes, Simon Ives, Steve Dean, Stewart Horn and Stuart Douglas. Writers and editors whose work is reviewed include Adam Grydehoj, Akira Kurosawa and Shinobu Hashimoto, Allen Ashley, Anders Thomas Jensen, Antoine Bauza and Ludovic Maublanc, C.Z Dunn, Chris Kelso, Christopher Nuttall, Derf Backderf, Federico Fellini and Bernadino Zapponi, Hal Duncan and Chris Kelso, Hal E. Chester, Patricia Moyes, Peter Ustinov and Frank Tarlof, Ian C. Douglas, Jay Basu and Tom Green, Jesse Bullington, Jilly Paddock, Jim Beard, Joe Giannone, Joel Lane, Laeta Kalogridis and Patrick Lussier, Lisanne Valente, Mark Bousquet, Massimo Berruti, S.T. Joshi and Sam Gafford, Matko Srsen, trans. Celia Hawkesworth, Meg LeFauve, Josh Cooley and Pete Docter, Michael Cisco, Oliver Langmead, Paul Magrs, Paula Guran, Peter A. David, Pierro Regnoli, Tony Corti and Jose Luis Delgado, Ray Tyrrell, Ron Fortier, Simon Kewin, Stephen Theaker and John Greenwood, Tadeusz Kwiatkowski, Tim Herlihy and Timothy Dowling, and Wojciech Has. 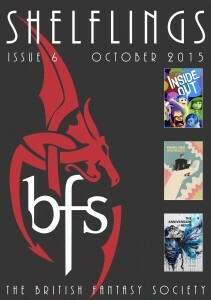 If you would be interested in reviewing books, games, comics or anything else fantastical for the BFS, or in submitting material for review, see our page about the review teams for more information.